I woke up at the crack this morning (not usual what with a newborn, but she was fast asleep) to the sound of a bleating goat. This wouldn’t be unusual except that I gave my goats away some weeks ago. I feel like I might be letting people down in admitting this but I just could not stay on top of the goats and the baby. When Francis would cry, the goats would hear and began crying. I would be sitting there in my LazyBoy, trying to settle Franny down and I would imagine how I would just open up the gate and let the goats free. Some days I would forget if I fed the goats or not. When I did, I would invariably be carrying the baby while I threw them a chunk of hay, and it would get all over Franny. Forget about mucking out the goat area. I just couldn’t do both–care for goats and a baby. I had to choose. Of course I chose Francis. I remember I used to read this one farmgirl’s blog a few years ago. I loved it, she was really sarcastic and funny, then one day her posts changed. She kept talking about her bun in the oven, not about funny things that happened on the farm. 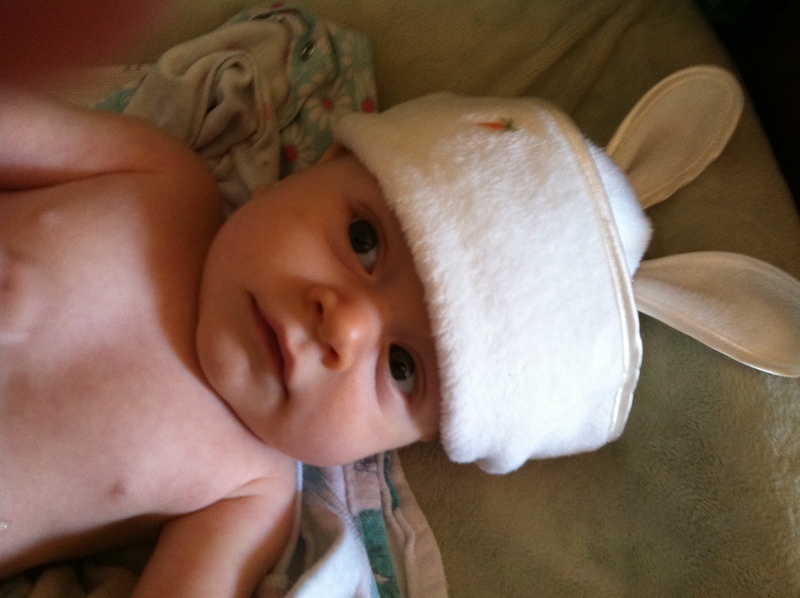 Then the baby came, and I stopped reading her blog. I felt betrayed, annoyed, BORED. I hope none of you feel that way, but I understand if so. I remember asking my sister if having a baby was like having livestock. I can report that it is, but 20 times more time consuming and identity modifying. I was lucky that I have a great community of goaters, and Bebe and Gretel went to good homes, where they are happy and loved. The Oakland’s Havenscourt Homestead’s Nigerian Dwarf Goat Petting Zoo is available from noon to 4:00 p.m.
Willow and I will be there too, doing a honey extraction demo from 1-2, followed by a panel discussion and signing our new book, “The Essential Urban Farmer.” Margo True, Sunset Magazine Food Editor and editor of Sunset’s popular book, “The One-Block Feast,” will moderate. Also, Sunday at noon, I’ll be at Jack London Square Farmers’ Market doing a little soft shoe. As for the nickering sounds, I leaned in to Francis, and realized it was her, snoring. Bringing a baby into the world makes you realize how important your community is. For company on those long days of breastfeeding, for homemade meals when you feel like boiling water for tea is nearly impossible, for gifts that remind you that this is a good world. We’ve had several visitors every day since our daughter, Francis Cabell Amanita Jacobs, was born, including Moses from Brothers Market–his wife made this amazing Yemeni bread; Francis the metal collector; dear friends bearing meals of soup and brisket, shepherds pie, beer, arepas. Thanks guys!! 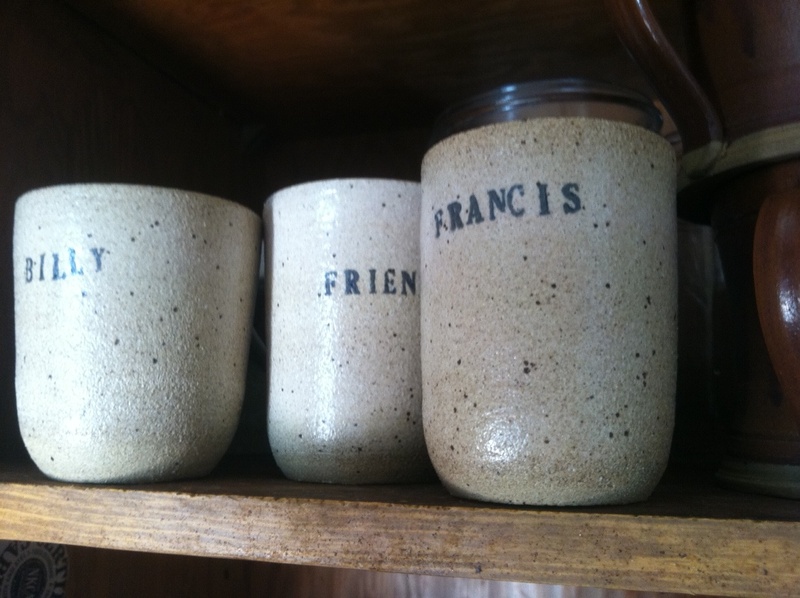 One of my favorite gifts came from Sadie and Emma, two talented potters.They made these drinking cups–one for Francis, Billy, Novella, and Friend. So cute. Cheers to hand-made pottery and good friends. And Happy Spring! !